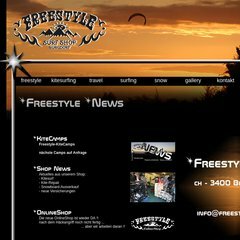 shop.freestyle-shop.ch FREESTYLE - ONLINE - SHOP / Kitesurfing-Surfing-Snowboarding ..
Ses 2 serveurs DNS sont ns132.hoststar.ch, et ns131.hoststar.ch. Son serveur web se trouve à Hetzner Online Ag (Bayern, Nuernberg.) L'adresse IP de Freestyle-shop.ch est 85.10.192.4. PING www. (85.10.192.4) 56(84) bytes of data.